Click “Install Sample Data” button from the top ribbon. 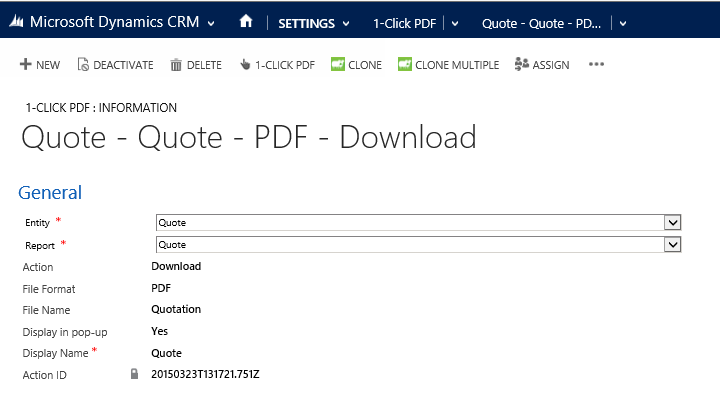 This will create 3 sample configuration records – for Account, Contact and Quote entity. There are two more fields on this form which are hidden by default. If you need to use the Custom button functionality then open this form in edit mode and set the “Custom button” section property to “Display by default”. When 1-Click PDF button is clicked from ribbon then a pop-up is shown with all the configured reports. This is system generated ID. This ID is used when custom 1-Click button needs to be added to any form. Refer section 2.12 for more details.